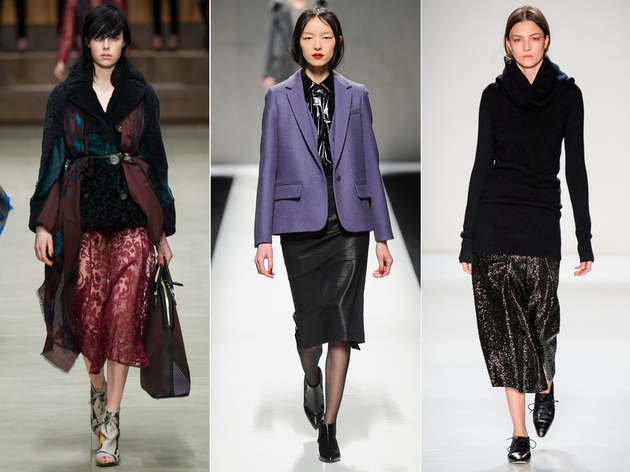 Fall 2014 Fashion Trends to Wear. 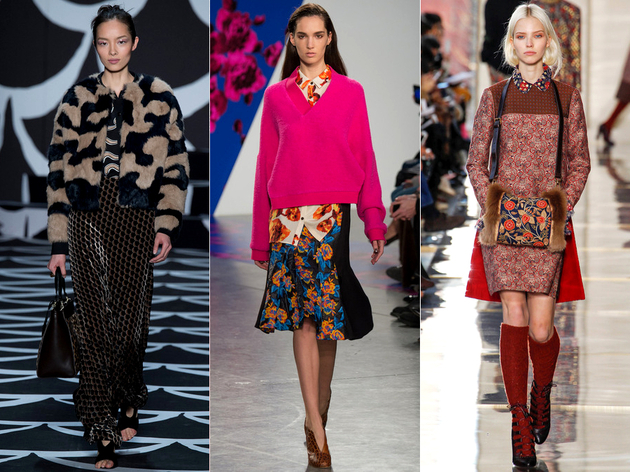 10 Most Wearable Fall 2014 Trends. Fall colors include everything from red and orange to blues and grays, with a fabric selection that ranges from traditional plaids and tartans to velvet in solid colors. Discover the most wearable Fall 2014 trends, and find out how to express your own style with these season’s hottest items. 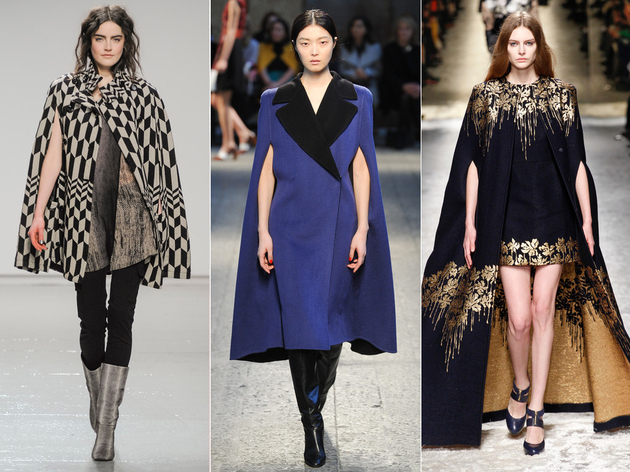 Check out the most important and easy to wear trends for Fall 2014 and Winter 2015, from reinterpreted classics to more daring looks, that include print mixing and even capes that come off as modern and sophisticated. If you’ve ever wanted to experiment with more than one print, this season might be the best time to do it. Houndstooth and animal prints have been featured during many runway shows at Fashion Week, but digital and geometric prints are equally trendy. You can even mix two floral prints for a cool effect. Look for inspiration in the newest designs by Christian Dior, Diane von Furstenberg, Tory Burch, and Thakoon. 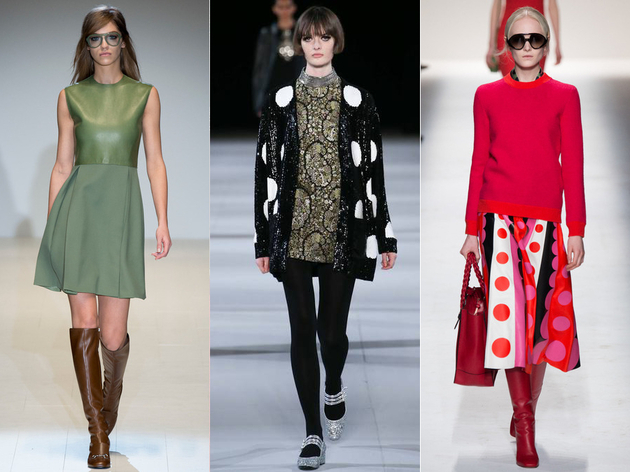 If you’re a fan of mod fashion, you’ll find retro lines one of the most wearable Fall 2014 trends. You can also go as back as the ‘50s with full skirts and gloves, but the short shift dress of the ‘60s is truly the retro pièce de résistance of the season. Versace, Saint Laurent, Gucci, Louis Vuitton, and Valentino are among the biggest brand who embraced the retro look for this fall. After wearing knee length or shorter skirts all summer, it’s time to try something different for the next season. Midi skirts are coming back, despite many stylists claiming they’re completely unflattering. Seen on the runway in the latest Victoria Beckham, Suno and Burberry collections, they also work with crop tops for the warmest days of the fall. 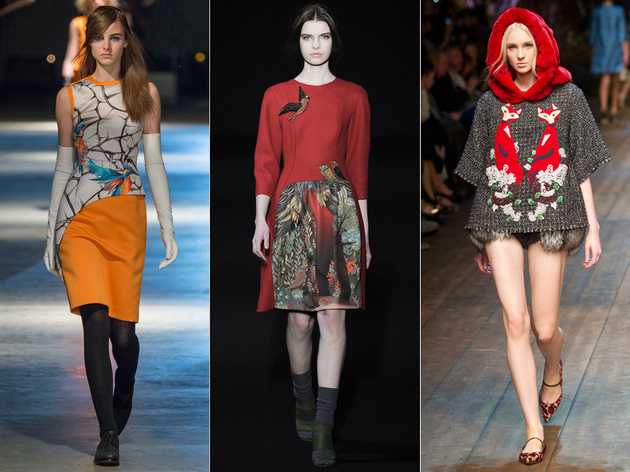 Definitely one of the most wearable Fall 2014 trends, animal accents took over the runway in the form of more than just prints. Animal motifs, either embroidered or collaged, have made a big splash with birds taking the top spot in collections from Dolce & Gabbana, Alberta Ferretti, Giles, and Marchesa Voyage. Black and white was a big part of Pre-Fall 2014 collections, including Alexander Wang, Alice+Olivia and Bottega Veneta. The combination is still going strong in the latest runway collection, but gray is also making its way into this fall’s style. 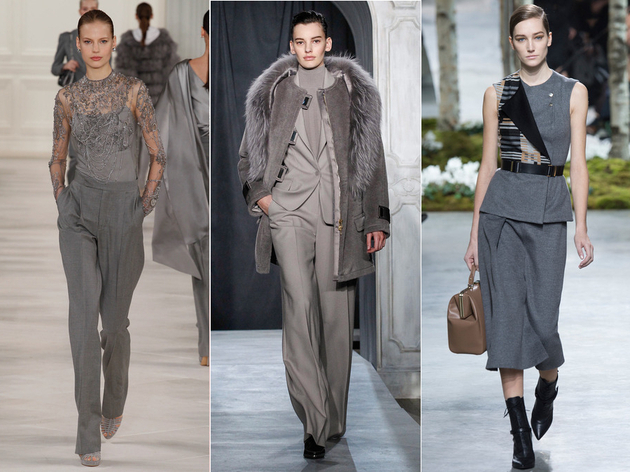 Jason Wu, Ralph Lauren and Hugo boss tried all gray looks on the runway. Don’t be afraid to mix this subdued neutral with vibrant shades for a stylish effect. 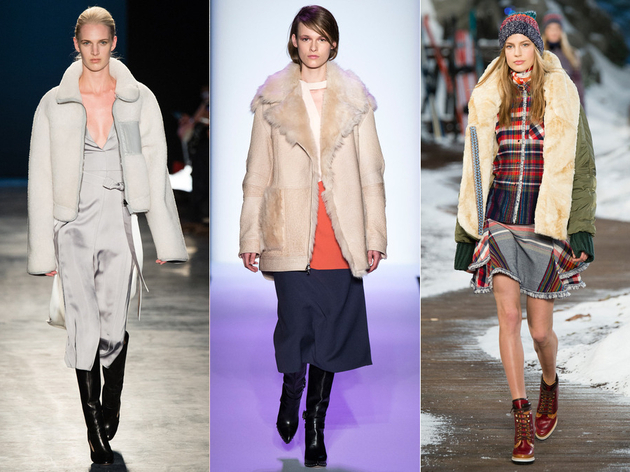 Blanket coats and wrap coats took over the runway as one of the most wearable Fall 2014 trends. Featured in collections from Altuzarra, Roberto Cavalli, Burberry Prorsum, DKNY and more, wrap coats are continuing the voluminous trend started this spring by boxy jackets. A cold weather staple, shearling couldn’t be completely absent from Fall-Winter collections, but this year it’s definitely bigger than usual. As seen on the runway in collections from Thakoon, BCBG Max Azria, Altuzarra, Tommy Hilfiger, and 3.1 Phillip Lim, shearling is just as trendy as an accent or an all over look for jackets. 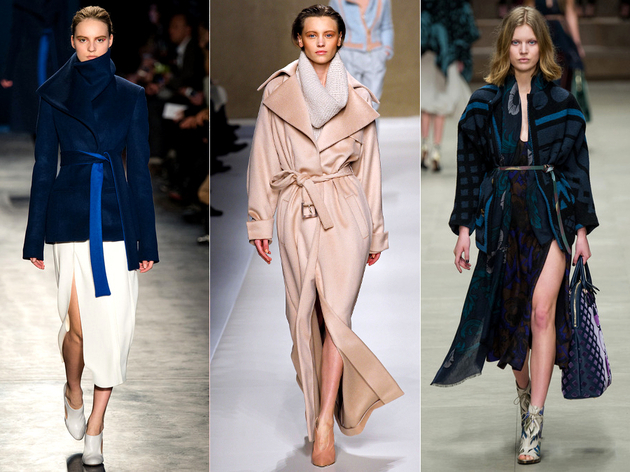 One of the most wearable Fall 2014 trends is also the most comfortable one. Layering knits isn’t about the bulky look, as Stella McCartney, Marc Jacobs and Calvin Klein have proved. 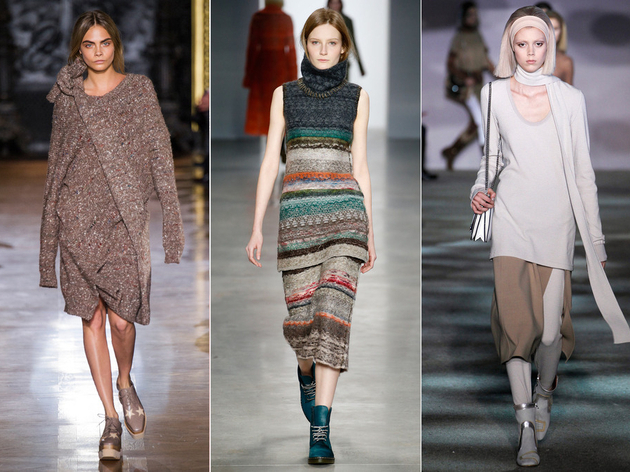 Instead, major designers are using knit layering for sleek fall looks in their latest collections. “Wearable” might not be the first thing that pops into your mind when you think of capes, but refined and modern interpretations of this piece are definitely worth your attention. While blanket coats can contribute to a bulky look, capes from Tracy Reese and Kate Spade New York have showed how to rock a fall staple in a sleek and polished way. 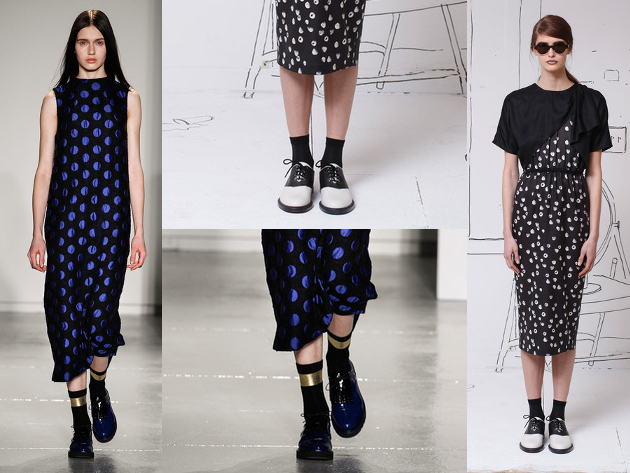 Definitely one of the most wearable Fall 2014 trends, menswear-inspired oxfords have showed up on the runway in collections from Band of Outsiders and Suno. If you’re worried about creating a look that’s too masculine, pair them with feminine skirts and flowy tops to get the perfect balance in your fall style.